Bryce Crawford, one of our growers, is a fourth generation potato farmer who has spent his entire life in the Klamath Basin. Having grown up experiencing the beauty of our area, he is extremely talented at capturing the moments that make a life in agriculture so photogenic. Even better, he posts his photos on Instagram so we can all see what goes on throughout the year on the farm! "We're really busy a lot of the growing season," Bryce says, "so you have to really be intentional about taking the time to post pictures. But working from sun up to sun down and beyond, and being right in the fields instead of just driving by... you see things that maybe other people don't see, and it seems like people really enjoy looking at the things we [farmers] see all the time but usually don't take the time to capture in a picture. Plus, it's a fun way to communicate with other growers across the country about what we're up to." ... to beautiful images of the area and nearby surroundings on days off or during the offseason. To see more of Bryce's awesome photos, follow him on Instagram @bcfarms54! Don't have Instagram? Get the app and create an account at instagram.com or view his photos online by clicking here. We told you everything about how we harvest potatoes throughout the Fall in this blog... but have you ever wondered how you can still enjoy Cal-Ore Produce's potatoes all year long? It all comes down to our cellars, which keep potatoes at the absolute best conditions for long-term freshness. These particular cellars are each 250 feet long by 60 feet wide and hold 110,000 sacks of potatoes! Let's check out how they work! First, there's the control room, including state-of-the-art control panels. Potatoes thrive in around 40 degrees Fahrenheit and a high humidity, but just in case any changes need to be made, this control panel can be monitored and accessed from a smartphone, tablet, or computer from any location with a wireless connection! In the hallway shown above, there is essentially a giant swamp cooler that puts out cold, humid air that is spread through the entirety of the cellar with fans. These pipes shown below were placed beneath the potatoes during harvest and have holes in them so that even potatoes at the bottom of the gigantic pile get some of that refreshing cool humidity. For even more detailed distribution of air, any of these pipes can be blocked with the white panels. Pretty neat, huh? While we're here, let's see how our potatoes are doing! These lights are usually kept off because darkness is another helpful way to keep potatoes fresh, but boy was I grateful to have them on walking nearly the length of a football field on this catwalk! Ed Staunton, one of our farmers, went to check and see how the potatoes are doing and, judging by his smile, they're doing great! And taking a closer look ourselves, we agree - months after harvest, these potatoes are still in fantastic condition to be cleaned off, boxed up, and sent off to make delicious dinners for you and thousands of others who love Cal-Ore Produce's potatoes! If you're looking for a side dish you can throw together fast and pair with most entrees, these baked fries are some family favorites! Plus, by baking the potato wedges instead of frying them, they're as good for your health as they are tasty! Preheat your oven to 425 degrees Fahrenheit. This heat is going to help give your fries some seriously satisfying crispiness! Now, gather your potatoes together and give them a good wash. It really doesn't matter how many, but I usually use two (three if I have dinner guests). Also, Russets, Yukon Golds, and Reds all work phenomenally in this recipe - I just used Russets this time because they were what I had on hand. Okay, now it's time to introduce the ingredients that make these potatoes even more delicious: Salt, Pepper, Garlic Salt, and Olive Oil. These ingredients have a permanent home on my kitchen counter because they make everything taste great! But the best thing about this recipe is that you can tweak these ingredients to fit your taste or needs - for example, if you are cutting back on sodium, you could kick out the garlic salt and salt but use minced garlic or flavored oil to maintain the fullness of flavor. I swear by nonstick because it saves so much time and headache lifting the fries from the sheet later. But, if yours isn't nonstick, just use more oil or flip 5 minutes into baking to be safe! Time to add the taters! Make sure they are all touching the bottom of the pan to get the best texture later. Now bring back that olive oil and lightly drizzle it over the potatoes. Then, sprinkle salt, pepper, and garlic salt over the fries, about 2 teaspoons of each - however, add to your own taste! The more spices you see on any potato wedge, the more flavor you're going to have, so it's really up to you to make your version of the perfect fries. Remember, you can use less of any spice you don't like and add other spices you may prefer if you feel like mixing things up. ... and serve them up to the soon-to-be satisfied people at your table! I hope you love them as much as my family does! Preheat oven to 425 degrees Fahrenheit. 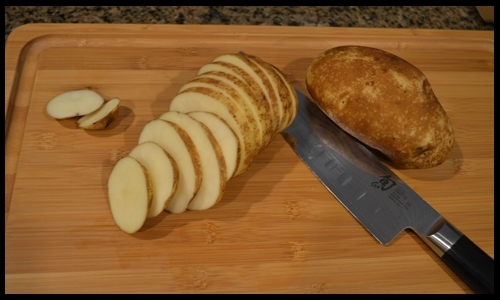 Cut potatoes into 1/4 inch slices, discarding ends, then quarter the slices to make wedges. 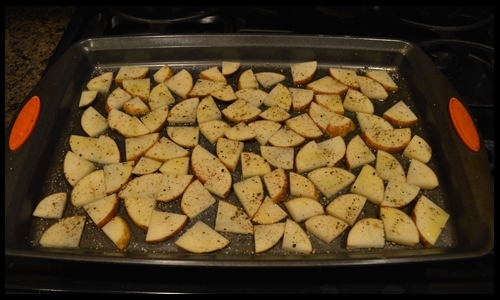 Drizzle olive oil over a nonstick baking sheet and add potatoes. Lightly drizzle olive oil on top of the fries and sprinkle the salt, pepper, and garlic salt over the fries to season. Bake for 30 minutes, lift from baking sheet with a spatula, and serve immediately. In the spirit of the Christmas season, we at Cal-Ore Produce have taken great joy in giving back to our community and beyond throughout the month of December. Here are just some highlights of the fun we’ve had partnering with a number of great organizations and meaningful causes this month! When we heard that, of course we wanted to help out. 400 potatoes, lots of full tummies and a fun time later, $1,800 were raised to directly help the students who need it. We are so grateful to have had the chance to help out! These weren’t the only potatoes we gave away though – we were honored to help out the Klamath Food Bank by sending a semi full of potatoes their way. They were extremely grateful; however, with our shipment, they were so well stocked that they asked if it would be all right if they could pass some potatoes on to the Portland Food Bank. As our manager of Plant Operations, John Hughto, said, “Of course—the more that can be fed the better! Potatoes that have gone to waste don’t do any good for anyone.” All of us at Cal-Ore Produce couldn’t agree more! We were thrilled to contribute financially to Friends of the Children, an Oregon-based operation that uses professional mentors to enrich the lives of children who are particularly at risk. We also were excited to make the decision to donate $8,000 each year for the next five years to the Oregon State University’s Potato Research and Extension program which we believe will enhance and better the industry we know and love. We feel so much love and support from our families and community it only seems fitting to turn around and offer support back. It is so rewarding and amazing to see how different parts of our community help each other out with every kind of need! Merry Christmas and a Happy New Year from all of us at Cal-Ore Produce! There's not much better than getting to see an entire year's worth of planning and labor come to fruition before your very eyes, and that is what our farmers get every year as thousands upon thousands of potatoes are moved from the dirt of the fields to our storage cellars. 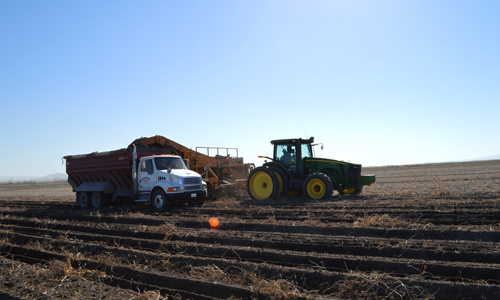 The process of potato harvest takes a lot of work but it's rewarding, fun to watch, and fun to share with others! As a truck gets to the potato field being harvested, the driver lowers the left wall of the truck so the potatoes can go into the truck without being dropped from too high. The tractor driver is always ready for the next truck to be filled. The equipment behind the tractor is called a bulker. Bulkers are extremely versatile - they dig potatoes, separate a lot of the vines and weeds out from the potatoes, and move the potatoes through a series of conveyor belts to what we call the boom, which lowers into the truck to load it with potatoes. From behind, you can see the vines and weeds blowing out from the bulker as well as the truck getting loaded with freshly dug potatoes! The truck driver follows signals from the tractor driver to make sure the truck is filled as evenly as possible (which means more potatoes fit). This truck's driver is about to put the side back up to continue filling up until it is completely full. As the truck gets near to being full, another truck drives up to get ready to keep the cycle of digging potatoes going! The full truck makes the drive back to the storage cellar. Back at the cellar, a hatch in the back of the truck is raised. A conveyor belt at the bottom of the truck bed propels the potatoes out onto another conveyor belt. Workers like this gentleman carefully watch the harvested potatoes to make sure any damaged potatoes or vines are removed from the line. 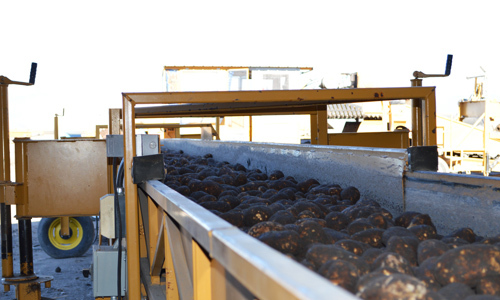 Potatoes continue moving through the conveyor system to a protected sorting area. The pile of dirt and potatoes going off to the right is some of what is separated from the harvested potatoes so the crop is only our highest quality potatoes. ... and finally make it up this piece of equipment called an elevator into our storage cellars. The potatoes will rest in this perfectly controlled environment until they are ready to be packaged at Cal-Ore Produce and can eventually make it to your table! Leave a comment below if you want to learn more about potato harvest - we would love to answer your questions! There are always fun and exciting things going on at Cal-Ore Produce so we are thrilled to have a blog so we can share our experiences in our community with you! Keep checking in to read about everything from the farming process to our families to great ways to enjoy our potatoes. Also, like us on Facebook or follow us on Twitter if you would like to have even more frequent updates, photos and more. There are always fun and exciting things going on at Cal-Ore Produce so we are thrilled to have a blog so we can share our experiences with you more fully! Keep checking in to read about everything from the farming process to our families to great ways to enjoy our potatoes. Also, like us on Facebook or follow us on Twitter if you would like to have even more frequent updates, photos and more.